It’ll fly in for you you’ll be enjoying it so much, but the actual performance time for the Vaults experience is approximately 60 minutes. This doesn’t include any time that you might have to queue (and though we do our very best, sometimes queues are just unavoidable). Afterwards you can catch your breath and have a cup of tea or something a little bit stronger in our unique café and retail emporium, The Parlour. Which means allowing 2 hours should be ample for your visit. The time listed on your ticket isn’t the show time but rather the time that you should arrive at the Vaults tourist attraction. There will inevitably be a certain amount of queuing involved but we aim to keep it to a minimum. You should allow yourself two hours for a visit to the Vaults which will cover entry, the performance and enough time for a bit of browsing and relaxing afterwards. Children under the age of 15 must be accompanied by an adult – but sure you’d hardly let them off on their own anyway! If you’re turning up unannounced, then early in the morning is probably best for you. However, during peak periods we’re crammed with people trying to get in, which is why we recommend that you purchase your ticket in advance– and save yourself not just a little bit of heartache but also up to 20% off the door entry price. And if you have a voucher, we’ll be delighted to honour it, but check the website first as some vouchers allow online booking and some require you to turn up on the day. Vaults Live is located in The Schoolhouse, John’s Lane West – just off Thomas Street in Dublin 8. 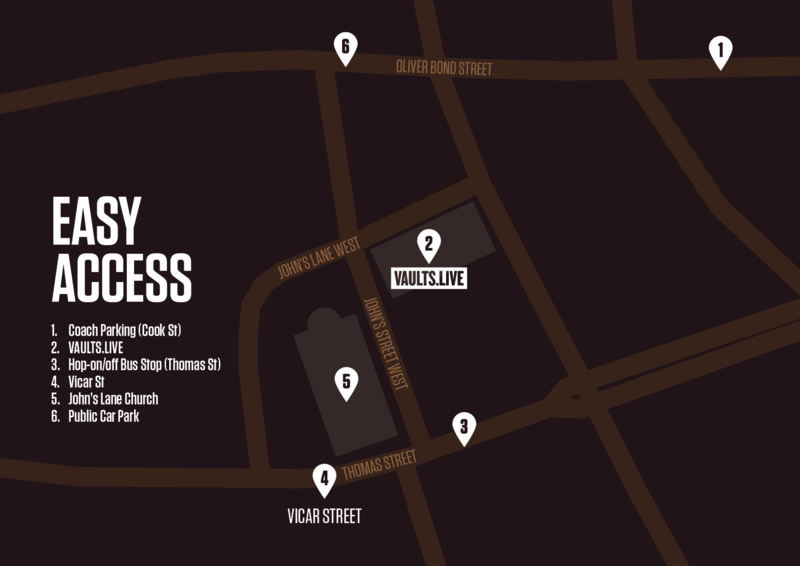 Or to put it another way, we’re situated on the route between Dublinia and Guinness Storehouse! Unfortunately we don’t have a carpark on site for visitor use. However, if you do want to bring your car there are a number of car parks within a short stroll of the Vaults, see our map below for further details. WHO WILL ENJOY VAULTS LIVE? Obviously, the answer to that is everyone! The Vaults Live tourist attraction is perfect for young adults, families looking for new and thrilling things to do on the weekend, tourists visiting Dublin, and anyone who wants to enjoy Irish history in a live immersive theatre experience. But just to be sure here’s the answers to some questions that might crop up for your particular circumstances. ARE THERE ANY AGE RESTRICTIONS FOR VAULTS LIVE? Well, there’s no upper age limit, you can be as old as you like! The recommended age to enjoy the Vaults Live tourist attraction is 8 years and above but that’s at the discretion of the accompanying parent or guardian. Most children love the Vaults experience, but do bear in mind that there are dark and creepy areas in the experience there are more than its fair share of loud noises! If you do at any stage feel the need to get your child (or yourself!) out just speak to the actor in the show and they will arrange for someone to meet you at the nearest possible exit. No person under the age of 16 years old will be admitted to Vaults Live unless accompanied by an adult. An adult means a person that is at least 16 years old. We know we’ve said this a couple of times already, but, you know, some people just don’t listen! Booking in advance means you guarantee your preferred show time and save yourself time and effort. If you’re intent on paying an extra 20% you can, of course, purchase tickets at the Vaults Live tourist attraction venue when you arrive, we’re very happy to oblige! When you visit the Box Office you will be able to book a show time. You should then return to the Vaults at the allotted time to begin your experience. Please understand that while we’ll do everything that we can to get you into the show time that suits you, this might not be possible due to the number of people already booked into particular shows. But the earlier you arrive, the better your chances. And if you have a discount or voucher please make sure you tell us before booking so that we can honour it, once the tickets are printed unfortunately there’s not much we can do. When you get here you’ll enter through the Main Lobby and go directly to our pre-show area where you’ll need to wait for a few minutes until it’s time for your show to begin. From there we’ll guide you to the elevator in order to begin your full Vaults experience. This won’t come as a surprise to you but we’re a very popular attraction and so, during the obvious times shows tend to sell out very quickly. We’ll always do our level best to book you into the next available show time or find another day that will suit you. To avoid this (and we may have mentioned this already) we strongly recommend booking in advance via the website and printing off your tickets at home to enjoy the very easiest of entries to the Vaults. CAN I USE A VOUCHER? Absolutely. Not any old voucher, of course, but any voucher giving a discount to the Vaults will of course be honoured in full. HOW DO I MAKE A GROUP (10+) BOOKING? Sorry, but all tickets purchased are non-refundable and must be used on the date and time specified. For full terms and conditions just click here. I HAVE PRE-BOOKED TICKETS ONLINE – WHAT DO I DO WHEN I GET THERE? Okeydoke, well done you. Arrive at the Show Time indicated and present your ticket to one of our door staff and they’ll direct you to where you need to go. Just a quick word of warning – if you don’t arrive within your allocated show time you may be in for a bit of a wait for the next available show. Obviously in busy periods we can’t guarantee immediate entry if you arrive late.